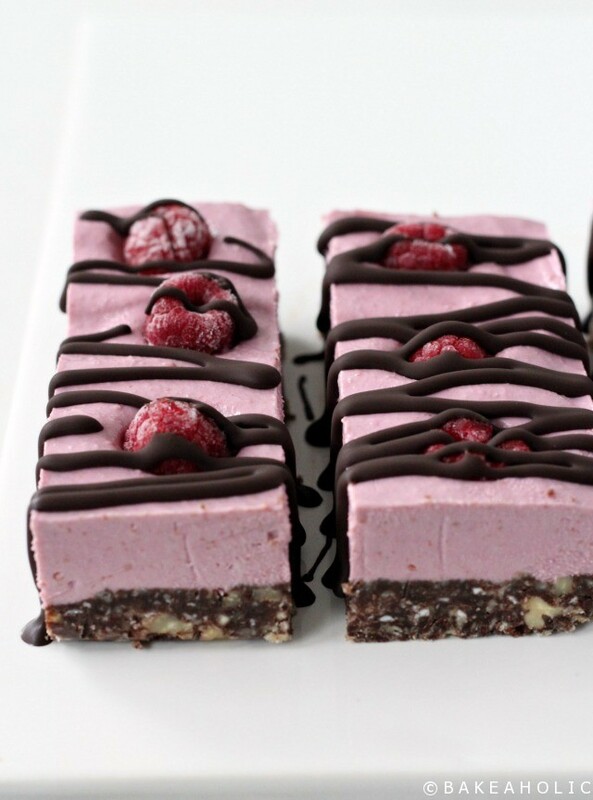 These vegan, raw raspberry slice bars were a delicious accident. I was actually making something else and ended up with a chocolate-y mess (i.e. a recipe that didn’t quite turn out right) that I just couldn’t toss out. 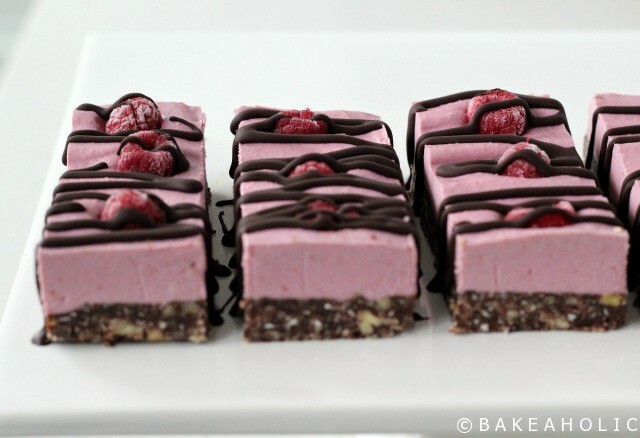 Instead, they became the base for these raspberry slice bars. My sister and I were baking in the kitchen – baking is a relative word, since we’re talking raw here – and I was thinking about lemon squares, but ended up with a chocolate base after the chocolate mess, thus – raspberry. It reminded me of how you begin to make nanaimo bars, melted chocolate is mixed with nuts and coconut, so I thought i’d try it out for the base and then go from there. This recipe actually turned out perfectly – how ironic. 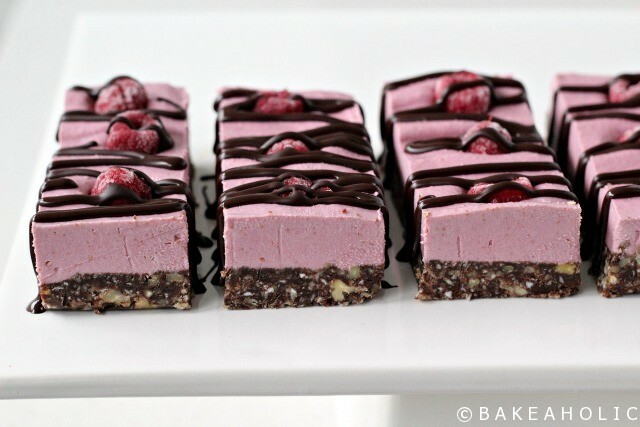 They’re almost like a raw cheesecake, but more of a slice/bar treat. When I think of cheesecake, I think of heavy, thick, and creamy – like my raw chocolate cheesecake. 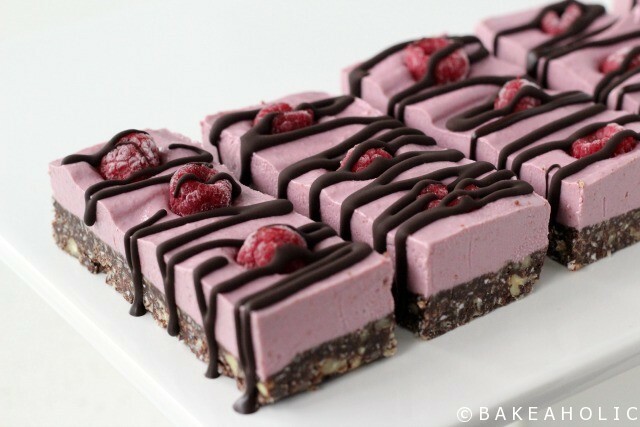 This Raspberry Slice is light and silky. Its Gluten Free, Refined Sugar Free, Vegan, and Raw – and 100% amazing. I made it in a loaf pan, so it’s the perfect size for two (lots of leftovers), four or six people. It’s best kept in the freezer, so you can freeze it and have a treat on hand for those nights you’re craving a little something sweet or a mid-afternoon pick-me-up. This Raspberry Slice is pretty in pink, just in time for Spring & Easter. 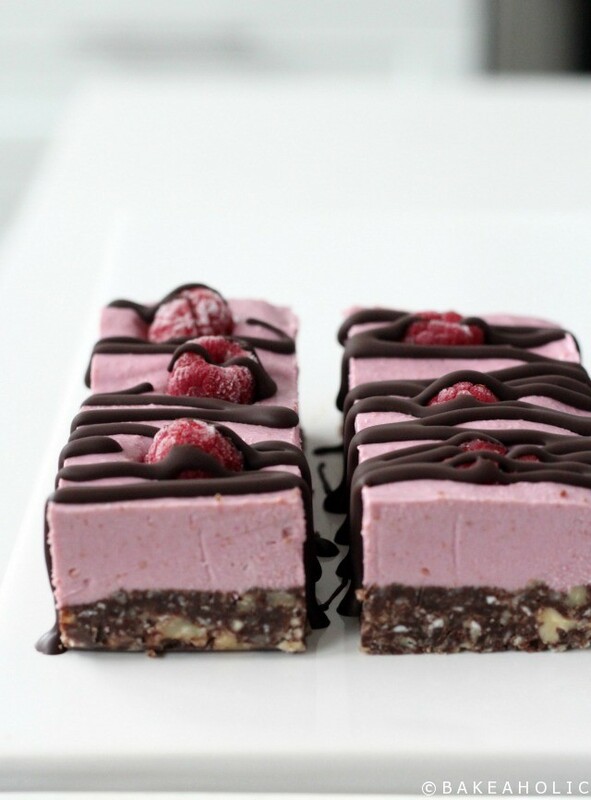 This Raw Raspberry slice is deliciously vegan, and guilt-free, making it the perfect mid-afternoon treat or dessert. A chocolatey base with coconut and nuts topped with a silky smooth raspberry layer. In double boiler, or in saucepan on low, melt coconut oil. Add cacao powder. Stir until melted. Remove from heat. Add coconut, walnuts and pecans to blender or food processor. Blend until small crumbs form. Stir into melted chocolate. Add mixture to a lined loaf pan, smooth out with the back of a spoon and place in the freezer to set. Blend all ingredients in high-speed blender - you may need to scoop it down a couple times, or if your blender has a tamper (blender stick) use that to stir it around. Blend until silky-smooth. Pour over base and smooth with a spatula or back of a spoon. If you like, add some raspberries to the top and press down. Place into the freezer for at least 1 hour. Melt the coconut in a double boiler on low heat, or in microwave on 1 minute intervals until melted. Add maple syrup to the double boiler and whisk until combined. Whisk in the cacao powder, and continue to whisk until smooth. Once your slice is set, remove from freezer and slice into long, pieces. Using a pastry bag, or small ziplock bag, fill with melted, cooled chocolate. Snip the end of a ziplock bag, and drizzle over top. Keep in freezer. Best if taken out 10 minutes before serving.